Castles in the Basque Country II. The Tower of Varona. The legends goes that there were three brothers and a sister, María Pérez, and the first three went to battle for Doña Urraca against king Alfonso of Aragón. The lady also participated in the battle, hidden under an armor, and at one moment she found herself battling against the king, face to face. She defeated him, and admired by her braveness and after finding out he had been fighting with a woman, he told her “You´ve fought bravely, not as a feeble woman, but as a strong warrior. Therefore, you will not be considered a man hereafter (“Varón”, in Spanish), but “Varona” in feminine, and thus that will be the name for your descendents”. And so her name changed from Pérez to Varona. This entry was posted in Araba, Attractions, Basque, Castles, Nature, Parks and tagged Álava, Añana, Araba, Basque, Castle, Espejo, names, Tuesta, Varona, Villanañe on June 18, 2011 by Leire Gaceo. 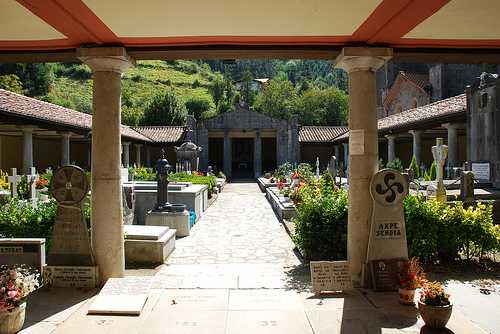 Traditional names in the Basque Country were very common in the past: Jesús, María, José, Antonio, Francisco, Ángel, Ángeles, Piedad, …Yes, many people are called Jesus in Spain (without any religious connotation!!) And what´s more, they are called in many cases Jesús María (for a man) or María Jesús (for a woman). Or José María (man) or María José (woman). The custom was to put the name of the saint of the day to the newborn, or a biblical name. By the way, those called José are called Pepe (coming from P.P., short for Pater Putativo, a father that really isn´t), those called Jesus Maria are called Txusma or Jesusmari…Spanish names have a lot of “diminutive” alias. In the 80´s there was a strong current in favour of Basque names, based on Basque mythology or on nature. Hence, we got many “Aitor” (father of the Basques), “Amaia” (the mother), Garikoitz, Aritz (oak), Harri (stone), Eder (pretty), Garazi (special), Gorka (translation for George), Ibai (river), Odei (cloud), Ainara (swallow), Oihane (scream), Irati (a virgin and also a forest),…These names have nothing to do with Spanish ones and are a clear sign of the origin (and sometimes, of the political views) of the parents. Also, many names are based on Virgin´s names, for instance, Arantza (from the Virgin of Arantzazu) or Begoña. Basque surnames are also different. In many cases, they show the place of origin of the person. Etxebarria (or Echevarria) means “New House”, Madariaga (Place with Pear Trees), Ibarra (Valley), Urrunaga (Far Away Place), Arizmendi (Oak Mountain), etc. There are very long Basque surnames, with long meanings (Agirregomezkorta, Atxalandabaso, Aguinagalde, Uriberrementeria, Bedialauneta, Ocerinjauregui,…). An interesting place to visit and see the extraordinary long names in the tombs is the Markina cemetery, beautiful area and beautiful cemetery. Last, in the Basque Country, as in Spain, we always use two surnames, the father´s first and then the mother´s. For example, a girl named Ainhoa, with a mother Ana García and a father David Zubizarreta, is named Ainhoa Zubizarreta García. Women don´t lose their maiden´s name when they marry. Now you can put the mother´s name first (as they do in Portugal, where they say that you always know who is the mother, but not so sure about the father…it makes sense!). Yes, I know, what the heck has this to do with Basque tourism…but I thought you may find the above interesting!! This entry was posted in Culture and tagged Basque, names, surnames on October 24, 2010 by Leire Gaceo.